When Star Wars: The Force Awakens first premiered last December, most fans were quick to call it great. Since then, some of the smoke has cleared, and several folks have decided they don't like it as much as they thought. There are plenty of problems to be found swimming around inside this long-anticipated sequel. And there is a lot to celebrate as well. It's a mixed bag, really, and director J.J. Abrams knew this would happen. There would be love, there would be hate, and there would be a lot of questions after the fact. He decided early that he would get out while the getting was good. Shortly after it was announced that the filmmaker was directing Star Wars: The Force Awakens, he made it well-known that he had no intentions of returning for a follow-up. And he has a great reason why. J.J. Abrams doesn't like to stay in one place for a long period of time. And that includes the Star Wars universe. Even though he directed two Star Trek movies, the experience soured him on sequels. He had the opportunity to come back and direct Star Wars: Episode VIII and Star Wars: Episode IX, but he wanted to hand the chance to play in this sandbox off to someone else. And the chances of him returning to direct a spinoff are next to nil. Why is he so intent on staying far away from that galaxy that is already far, far away? He explains to Fortune. "It was a wonderful way to visit a place that meant so much to me and obviously so many. I knew that if it worked, it was the perfect time to step down - and if it didn't, no one would want me to do it anyway." J.J. Abrams hasn't completely stepped away from the behemoth franchise. He remains attached to the next two sequels as an executive producer, with Rian Johnson currently shooting Star Wars: Episode VIII and Colin Trevorrow taking the helm on the trilogy ending finale Star Wars: Episode IX, which many expect will conclude the Skywalker family opus that includes the prequel and original trilogies. 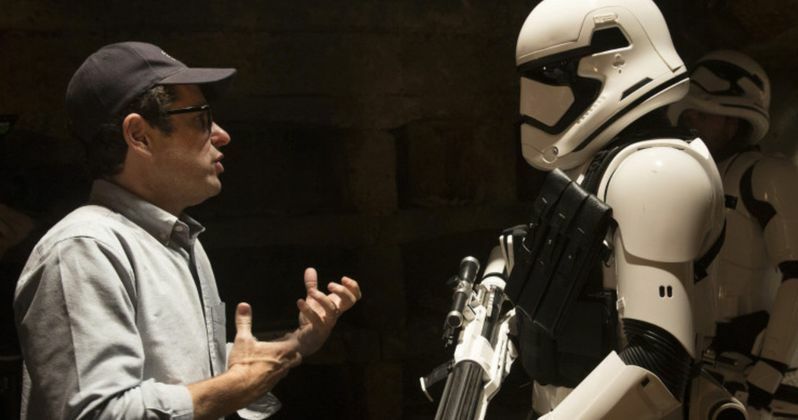 J.J. Abrams sounds a lot more relieved to be sitting in the producer's chair this time out. It certainly sounds a lot less stressful. "I'm very happy to be where I am. Rian Johnson is brilliant and needs no help from me. As executive producer, I've been collaborating with them, but they are obviously doing all of the heavy lifting and it's very exciting to see what's going on." J.J. Abrams has his hands quite full at the moment. He is also executive producing HBO's new Westworld series, which reimagines the sci-fi thriller for the small screen. This might be his longest-gestating passion project. He has this to say about the show, which debuts later this year. "Westworld is one of those things I've wanted to work on for so long. I had a meeting probably 21 years ago with Michael Crichton [who wrote and directed the 1973 original film] about doing this. And it's taken along time to get this going. At the heart of Westworld is this story of consciousness and oppression and discover. It's one of the projects I feel most grateful and lucky to be a part of. What [the directorial team has] done is so stunning and cool and they're not rushing it because of business maters and the network is giving them the time. That is never a bad move." What do you think? Are you sad to hear that, unless he gets some unexpected bug up his nose, J.J. Abrams will probably not direct another Star Wars movie? Do you think Rian Johnson and Colin Trevorrow will probably do a better job? Sound off in the comments below.